Ice cream, good. A gallon a day, bad. Your car, good. Your car going too fast, bad. All the stuff you can buy and do at the sporting goods store, fun. Any of it crashing upside your head, concussion. Food and fun, always good. Living only for food and fun, always bad. So what is it that I am selling you to death? A devotional! 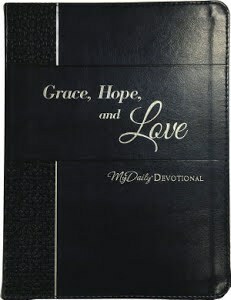 On my website, I have listed the Grace, Hope, and Love Daily Devotional. I think it is a fantastic collection of Scripture and applicable stories that would be a blessing to anyone who reads it, but I am warning you not to misuse it. Too many people misunderstand the intent of a devotional book. For them, something that was written to help their spiritual walk has become spiritually crippling. So that your devotional reading can be a blessing and not a curse, here is a list of cautions and encouragements when it comes to using devotionals. A devotional book is not a devoted life. The word devotion in Scripture is a powerful one. In the New Testament it is often translated from a word that entails three concepts; to beware, to believe, and to apply. This should be a daily expectation of the disciple seeking counsel from God’s Word. We need God’s Word to reveal, redeem, and repair areas of life of which we need to beware and/or be aware. We need our faith informed so we may more strongly believe. We need God’s Word applied so we may obey. A devotional book is purposed to help you with this endeavor in a daily, structured way. But devotional reading is not a devoted life. The word devotion in its strictest sense speaks of what you give yourself to. Devotion is not a something you read, it is something you do. We do not need a Bible reading plan as much as we need a Bible doing plan. Just because you are reading a devotional book does not mean you are giving yourself to the Lord in a devotional life. A devotional book is a start not a stop. Many great pastors and Christian thinkers have written devotional material to help shepherd and feed God’s people. There are many notable ones in churchdom, but one of classics is Charles Haddon Spurgeon’s Morning and Evening. The title reflects a constant theme in Scripture. In the creation week, there was evening and morning. David called for those who were truly devoted to God’s Word to meditate on it day and night (Psalm 1). Morning and evening, evening and morning is the rhythm of creation set in motion by God. Many people purchase devotional books that they use either first thing in the morning to get them going, or perhaps they use them at night as they seek to still the busy mind. I find no fault with either. Yet the concept of morning and evening as devotional reading is not meant as a discipline of consideration - as in to make sure you do it daily, but as a discipline of meditation to make sure it guides your thoughts throughout the ENTIRE day; as in starting with the morning and keeping you throughout the evening. Devotional books are quick reads to get you going, but the deeper call of God is for Bible intake, memorization, and study. I like to use material written by Warren Wiersbe as part of my devotional reading. He is about as meat and potatoes of a Christian author as they come. But he is not my stop, as in, I read it and now I have fulfilled the discipline. Rather, a Wiersbe’s book alongside God’s Word is my start, as in I will ingest it in a way so that I DO NOT stop thinking about it throughout the day - morning and evening! A devotional book is text, not context. Devotional books will often give you a verse or a chapter of Scripture to read and give you an immediate application of that passage to life. Awesome idea! In that sense, a devotional provides you a text. Where a devotional fails is that it does not provide you the context. Use a devotional, but read the Bible. Find out where those verses are IN Scripture. A devotional may tell you that this verse came from Ephesians, but what in the world is an Ephesians? Where is it? What is it about? Ephesians 2:10 is wonderful. Ephesians 2:10 in context is a masterpiece. I am a big advocate for having a paper copy of the Bible. Learn where the books of the Bible are located in the canon of Scripture. These books form the collective story of God. A devotional book is a bloom in a garden. Its intent is to pluck something sweet and fragrant that will inspire you, but the greater glory is the garden from which it came. Sure, the blooms are beautiful, but if you never walk the garden you really won’t smell the roses. The Christian life is not meant to be lived verse by verse. We are sovereignly immersed in the story of God. Each text/verse of the Bible exists within the larger context of God’s story. Use your devotional to point you to curious places. Use your Bible to walk the garden paths. A devotional is application, not exposition. One of the reasons people enjoy devotionals is because they quickly get to the point. Many people find it challenging to read the Bible, understand it, and know what to do with it. Yep, me too. Devotionals cut out the legwork. Don’t bog me down with long, arduous explanations of what passages say, just tell me what they mean. I recently had a conversation with a doctor about feeding tubes. Odd topic, I know, but sometimes a necessary one. As many doctors tend to be, he is an eclectic fellow, a highly intelligent man who walks to the beat of a different drum. In demonstrating to me the ease of use of a feeding tube, he demonstrated to me how one can conveniently uncork the tube, pour in a bottle of nutrients, re-cork the tube, chunk the now empty can of nutrients into the trash and go about the day. He said, “It would save me a whole lot of time having to eat.” I assure you, he was laughing when he said it, but I also think he was somewhat serious about the prospects of installing one on himself. Devotional books are spiritual feeding tubes. They will give you what you need, but wow, what a joy it is to chew! Feeding tubes may be faster, but there is a flavor in food you will soon miss if you do not have to break it down in your mouth. Sometimes a tube is necessary, but insane if we want one merely out of convenience. God gave you a tongue, not a tube! While it is true that what we need from God’s Word is application, there is a flavor that emerges from the hard work of exposition that helps us taste and see that the Lord is good. The Bible is not a ‘How To’ guide for life. It is a story. It is a poem. It is a command. It is a revelation. It is a multi-course meal robust with the flavor of God. Don’t forget to chew! A devotional is personal insight, not personal investment. 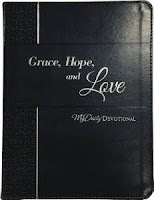 One of the things I like most about the Faith, Hope, and Love Devotional is that it gives you insight into God’s Word from 52 pastors, teachers, authors, and evangelists. It is an indispensable resource full of wisdom. These people have a journey with God that is curious to me and I love hearing from them. But wouldn’t you like to hear the voice of God for yourself? One of the great truths of Scripture is that we have a God who desires to be with His people. The Bible is filled with image-rich words that communicate the opportunity we have to be close to God. One of the words we translate as “prayer” in Scripture speaks of intimacy, not merely request. Prayer is not shouting aimlessly into the heavens, prayer is communing with God. Prayer is not an announcement over a megaphone, it is a conversation at the table. The only way to have a personal experience with God is to make a personal investment in His Word. Use a devotional book, but devote yourself to Bible study. It is a worn-out metaphor for many things, but the Christian life is not a microwave, it is a crock-pot way of living. We would like to think that a few convenient seconds is all we need to be like Christ. Devotional books ARE NOT intended to be the Bible nuked for you! There is NO devotional author worth their salt who would ever advocate his or her book as a replacement for the Bible. Their intent, my intent, is not to replace Biblical reading or meditation. Our intent is to inspire you to start somewhere and to help keep you there daily. At some point, the devotional book should be a gateway into something greater, not an end in itself. We have to simmer on Scripture if we are ever to truly appreciate the flavors of God that are there. There is no shortcut to the good stuff!